Justin Thomas of the United States plays his second shot on the first hole during the final round of the CJ Cup at Nine Bridges on Jeju Island, South Korea, on October 22, 2017. 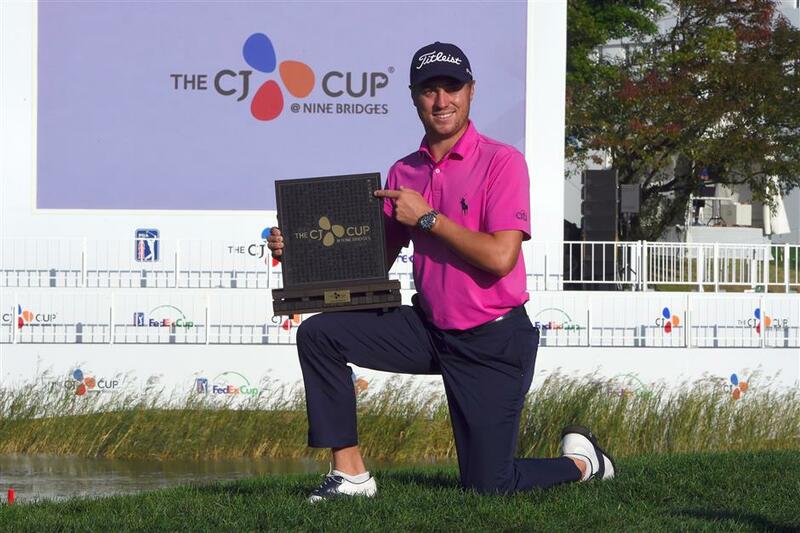 Justin Thomas beat Australia's Marc Leishman on the second playoff hole on Sunday to win the inaugural CJ Cup in South Korea and cap his breakout year on the PGA Tour. The pair went to a sudden-death playoff after completing the first US PGA Tour regular-season event in South Korea tied at 9-under 279. "I'm so excited to not do anything," the American said. "I officially have nothing left in the tank at this moment." Leishman, who ended a 5-year drought on the PGA Tour when he won the Arnold Palmer Invitational in March, then added the BMW Championship in September, looked to have slipped out of contention when he bogeyed the 5th, 7th and 8th holes to tumble down the leaderboard. But he birdied No. 9, No. 12 and No. 14 to join Thomas at 9-under then finished bogey-birdie to get in the playoff. "Obviously, disappointing to finish off that way. I probably got a little bit of a lifeline on the first playoff hole and I didn't take advantage of it. You give one of the best players in the world a chance like that, he's probably going to take it. Disappointed but second is not all bad," Leishman said. Fellow Australian Cameron Smith finished one stroke back in third place at 8-under with Whee Kim, the highest placed finisher of the 16 South Korean players in the field, finishing fourth at 7-under after closing with a 72. Brown (76), the overnight co-leader, endured a final round to forget with back-to-back double bogeys at the fourth and fifth derailing his title hopes, while Anirban Lahiri (74) was leading after going 2-under through 13 holes, but dropped four shots over the closing five holes. Both players finished on 5-under 283, tied for fifth place with Jamie Lovemark (71), Brian Harman (71), Luke List (72) and last week's CIMB Classic champion Pat Perez (68). Gaganjeet Bhullar of India poses with the trophy after winning the Macau Open at the Macau Golf and Country Club in China's Macau on October 22, 2017. In China's Macau, India's Gaganjeet Bhullar held his nerve to complete a wire-to-wire victory and lift his eighth Asian Tour title at the Macau Open on Sunday. Bhullar had seen his four-shot lead reduced to one in round three but on Sunday, he drained five birdies on the front nine and won by three shots despite a nerve-jangling double bogey on 16. The 29-year-old fired rounds of 64, 65, 74 and 68 for an aggregate score of 13-under 271, lifting his first Asian Tour trophy of the year. Fellow Indian Ajeetesh Sandhu and Filipino Angelo Que shared second place at the par-71 Macau Golf and Country Club, while Hung Chien-yao of Chinese Taipei was alone in fourth. Sandhu was gunning for his third title in a row after he claimed his maiden Asian Tour victory in Chinese Taipei this month and triumphed on the Japan Challenge Tour a week later. Bhullar, the 2012 champion in Macau, bogeyed his opening hole on Sunday before he stormed ahead with birdies on two, three, four, seven and nine to turn in 31. He also birdied 13 but dropped a shot on the next and picked up his double on 16, before finishing in style with his sixth birdie of the day in front of the galleries on 18.